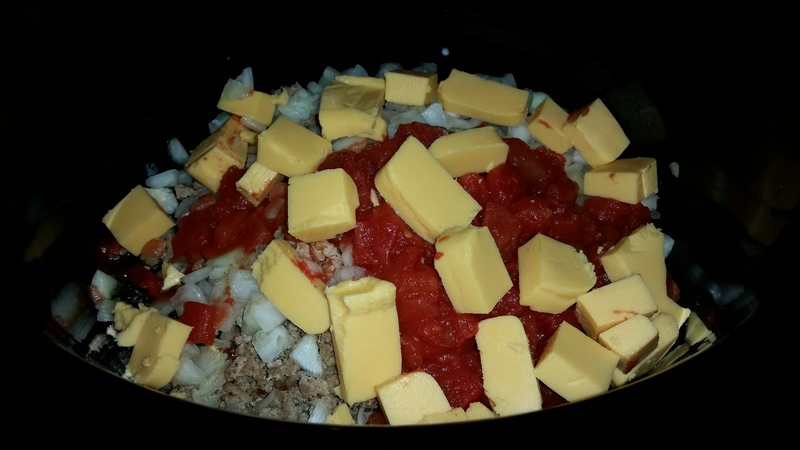 In browsing through Pinterest, I found a new recipe–Crockpot Cheeseburgers. 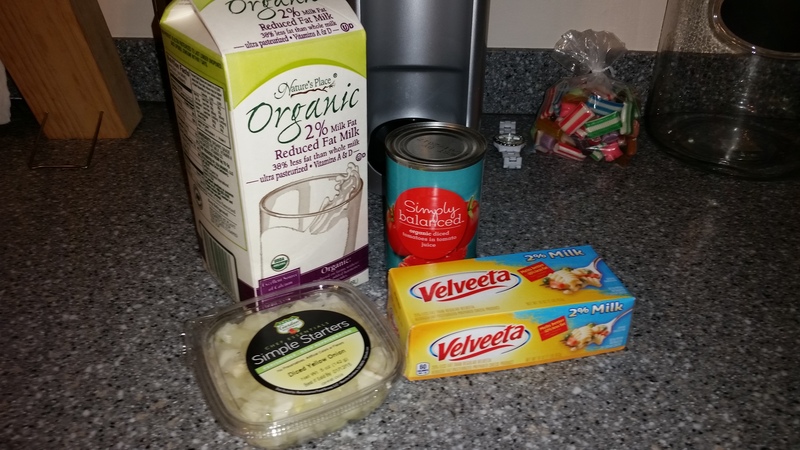 While I was a little turned off at the thought of using Velveeta Cheese (I’m fairly certain there’s nothing even remotely close to actual cheese in there), I figured I could get through it this one time. So I whipped out my crockpot, easily one of my favorite kitchen appliances, and it was on to cheeseburger land. Garnish- Mustard, Ketchup, Mayo, Pickles, Tomato, Etc. The recipe itself is fairly simple. You brown the beef in a skillet with one clove (or the equivalent to) one clove of garlic along with the salt and pepper. Once brown, you drain the beef and place it in the crockpot with the rest of the ingredients, minus the buns (if you opt to use them) and any garnishes you plan to use. Cover and cook on low for 5-6 hours. When finished, either plate it, like I did or use a bun to create a cheeseburger topped with the garnishes of your choosing. I will say, be careful about the amount of time you cook it. You want the cheese to be melted, but still somewhat thick. If you cook it too long, the cheese will become too thin. I could have probably cooked mine a little less and I went with five hours. I would have liked the cheese to be thicker and thus more like a cheeseburger and less like a soup. That’s really my only complaint. It had a good taste to it, it was just a little runny and maybe some of that would have been helped by using a bun. I may opt for a gluten free bun next time and will cook it a little less. The hamburger is already brown when it goes into the crockpot, so there’s really no harm in shortening up the cooking time. I do not own this recipe. This post reflects my experience with it. I’ll start off by saying I’m not a huge fan of pineapple, but this recipe wasn’t bad. It actually didn’t turn out that pineapple-y. My guess is the soy sauce mellows out the fruity flavor of the pineapple. 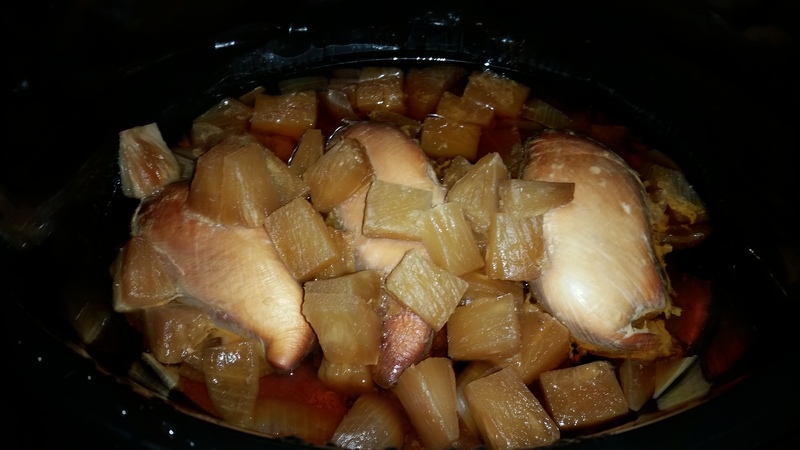 Chop onion and place in crock pot. Place Chicken Breast on top of onion. Dump the can of pineapple (juice and all) over the chicken. Dump the soy sauce and the chicken broth on top of everything. Serve over rice and with a steamed veggie. For my recipe, I used three chicken breasts from Wegmans. My husband and I buy the big club packs and freeze the breasts individually to cut costs. My pineapple was a can of the Dole Pineapple Tidbits and I used a white onion, plus gluten free soy sauce and Wegmans organic chicken broth. 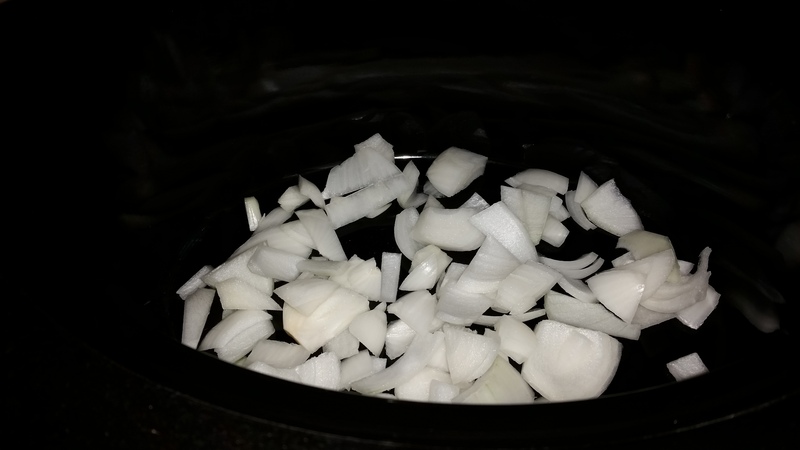 Following the instructions, I hand chopped my onion and placed it in my crockpot that I had sprayed with Coconut Oil to minimize sticking. 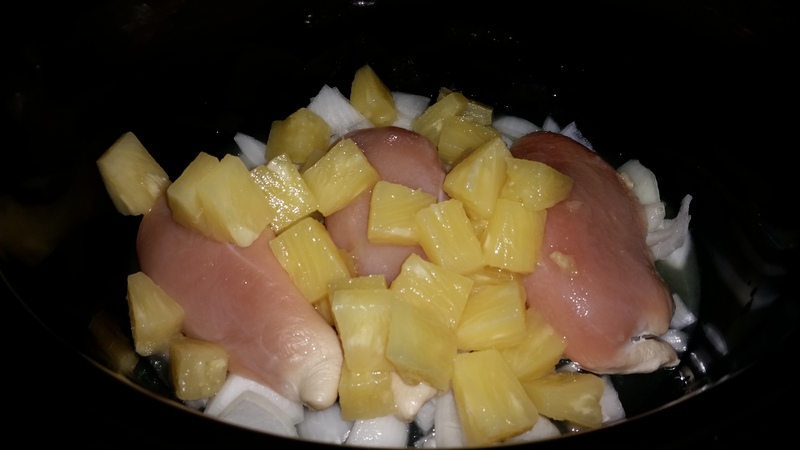 I then added my defrosted chicken breasts on top of the onion before adding the can of pineapple, soy sauce and chicken broth. 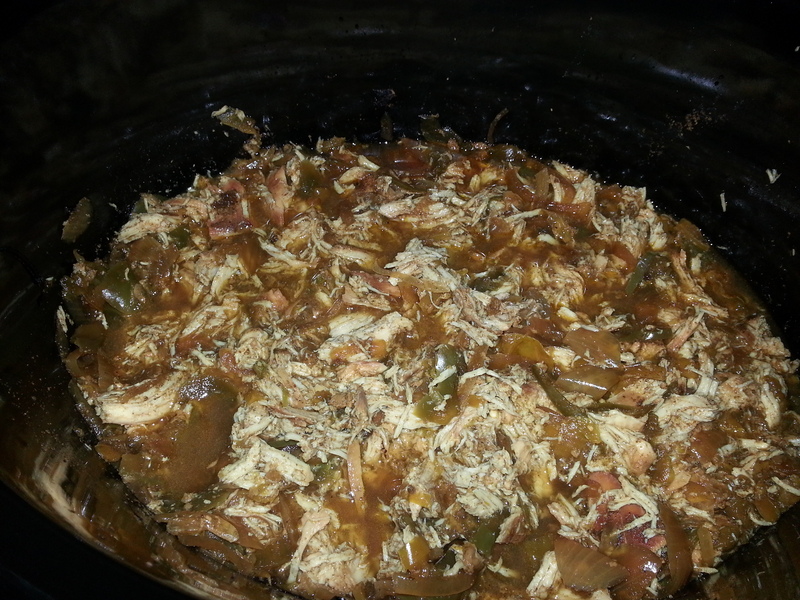 I then set my crockpot on low for 6 hours which ended up being more than enough time. When finished, I served over Market Pantry White Rice. I skipped the vegetable since the chicken was fairy thick and I felt the starchiness of the rice would be too much to then add a vegetable. The chicken was well-cooked and had a good flavor to it. I will say I’m finding out that I’m not a fan of soy sauce and chicken in the crockpot. It creates a strange flavor that I can’t really put my finger on. It’s a little heavy and with chicken, I would rather it be lighter. It could also be that this dish needs a little more seasoning or something extra. I can’t quite figure it out, but it was missing something. I’d love to hear what everyone else thinks after trying it. In the meantime, enjoy! I do not own this recipe. This blog represents my own experience with it. I’m a huge fan of naturally colorful food. There’s just something about it that screams healthy. Now note I say NATURALLY colored food. No, Cheetos do not count. I’m talking vibrant peppers and scallions, colorful fruit, green vegetables. Those kinds of things. So really, taking that into account, it’s no wonder that I love fajitas! I usually choose to make steak fajitas with bright peppers and onions. They’re not my husbands favorite, but he loves me so he eats them anyway. 1. I start off by cutting my steak into thin strips. I try to use organic steak, grass fed beef. I find it has a better quality and plus it doesn’t contain all the crazy things other beef does thanks to what the cows are fed and how the meat is treated. 2. Once my steak is cut into strips, I put a small amount of Olive Oil in a skillet and add the steak. I cook it until it’s well done, but not burnt. I like it done, but not overdone. 3. 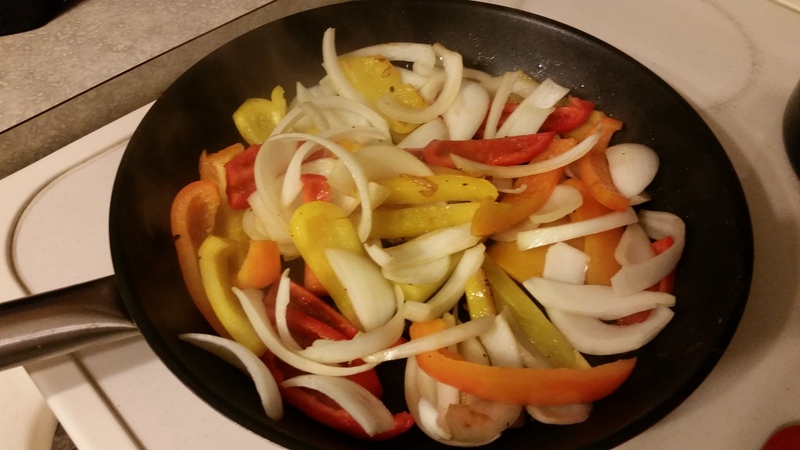 Setting my steak aside, I chop my peppers and onions into large pieces and add them to the already hot skillet. Adding a small amount of oil, I sautee the vegetables until finished. I don’t like them too cooked, but I do like them a little soft. Usually, when the onions are being to take on a darker appearance I know my vegetables are done. It’s really up to you how you want them. I don’t think there’s a wrong answer here. 4. When the vegetables are finished, I add the steak back into the skillet and heat everything together adding fajita seasoning. 5. When done, I usually serve them on a corn tortilla with shredded cheese and occasionally lettuce and tomato, depending on the mood I’m in. I will say corn tortillas are an acquired taste, so flour tortillas work just as good. Okay, now that I’ve made myself super hungry, enjoy your fajitas. Let me know how they come out. And if you wanted to send me some, I wouldn’t hate that either. 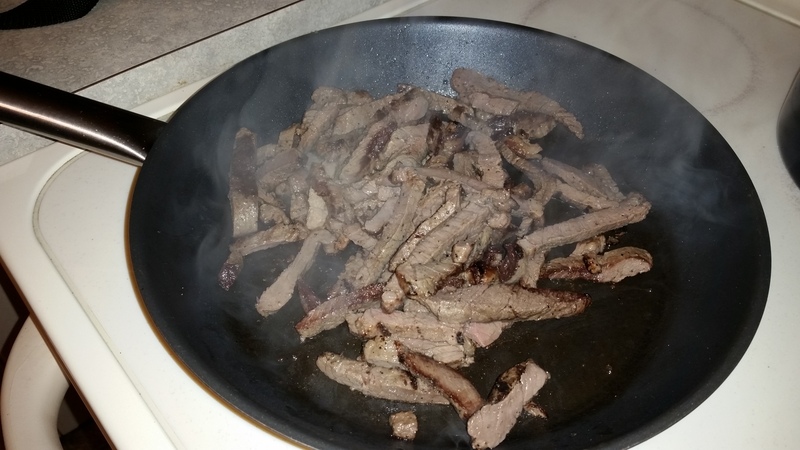 Keep in mind if you’re in a rush or don’t feel like working with raw meat, you can also pick up preseasoned fajita steak strips that you just have to heat up. It’s an option. One of my favorite things to do on a Saturday morning is visit the local farmer’s market. I take my Thirty-One Market Tote and head out with my husband to find some produce. 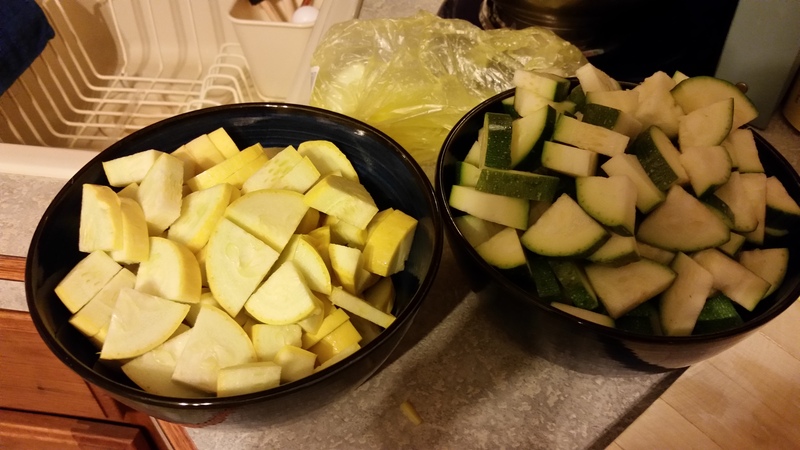 Recently, we picked up zucchini and squash, two vegetables I absolutely love. I usually saute them, but I wanted to try something a little different. 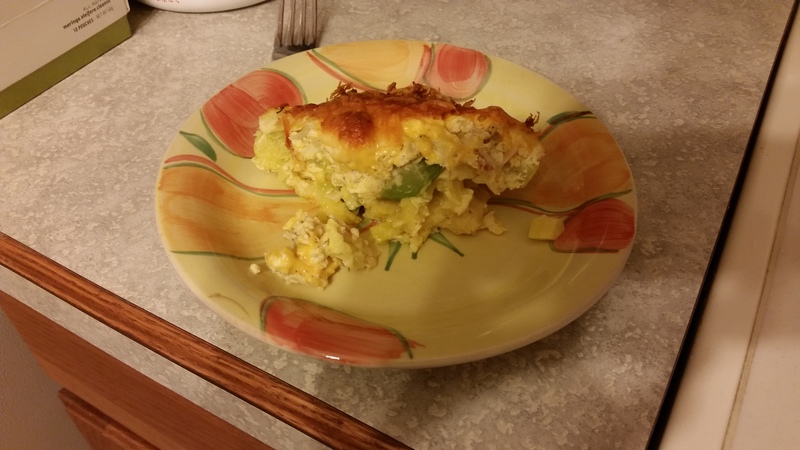 Behold, the grilled chicken squash and zucchini bake! Preheat oven to 350F. Grease a 9-inch deep-dish pie pan or 9-inch-square baking dish. Bring 4 cups water to a boil in a large saucepan. Add zucchini; reduce heat, and simmer, covered, until tender, about 3 minutes. Drain well in a colander. Press cracker crumbs on bottom of prepared pan to form a crust. Dot with butter. Spoon zucchini on top. Whisk eggs in a medium bowl until fluffy. Stir in onion, milk, 2/3 cup Cheddar cheese, salt and pepper. Pour over zucchini and sprinkle with remaining 1/3 cup Cheddar and Parmesan. Bake, uncovered, 35 minutes, or until golden on edges. As I’ve mentioned before, I’m gluten free so the first thing out the door were the cracker crumbs. Instead, I substituted in two cups of gluten free bread crumbs. 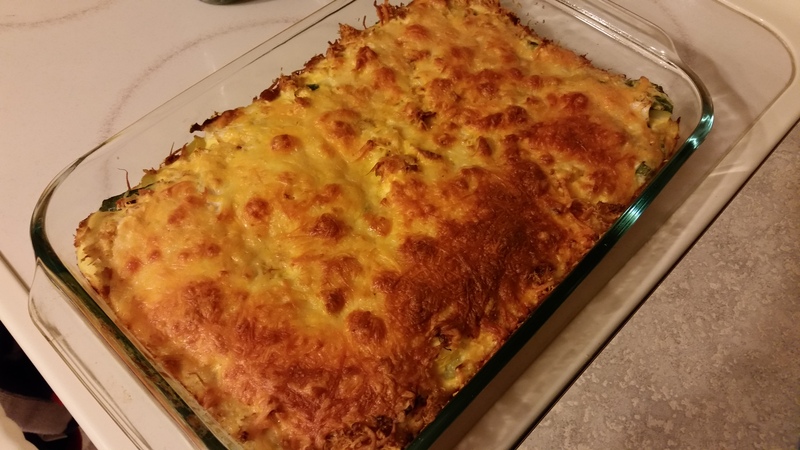 I then used organic eggs and milk and reduced fat cheese. I didn’t buy enough squash and zucchini at the market, so I added in some organic ones purchased at Wegmans. I also added in Bare Naked chicken tenders. Preheat oven to 350F. Grease a 9-inch deep-dish pie pan or 9-inch-square baking dish. I figured the chicken would add some size to the dish and I didn’t want it to be too thick so I used my Pyrex 9 x 13 baking dish. I sprayed it with Pam Organic Olive Oil to keep the casserole from sticking. Melt one tablespoon of organic butter in a large skillet and add chicken, cook until golden brown. 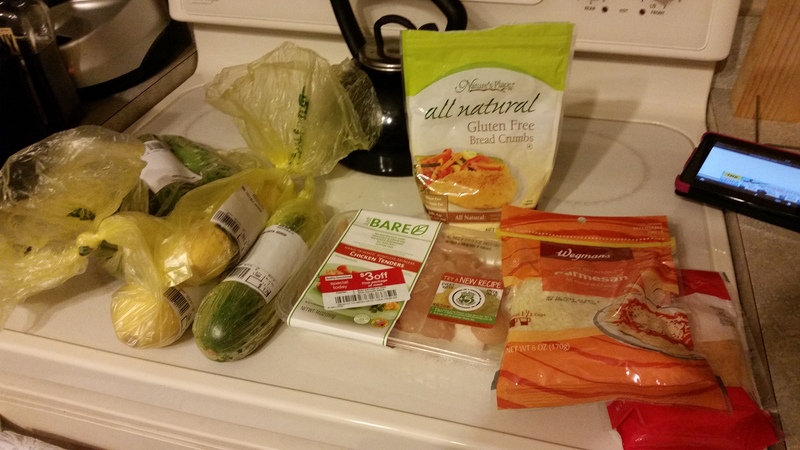 While the chicken is cooking, slice the zucchini and squash into triangular pieces. I first cut it into slices and then cut those slices into fourths. Why? I don’t know, it just seems to be the best size for a casserole. You don’t want the chunks to be too big. Bring 4 cups water to a boil in a large saucepan. 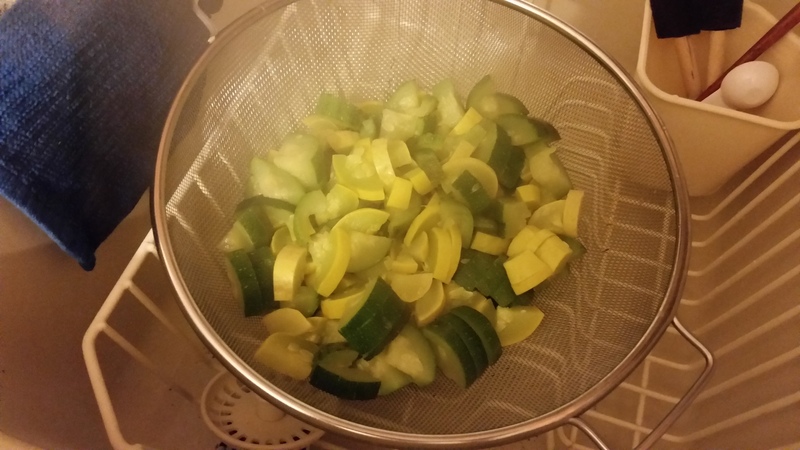 Add zucchini and squash; reduce heat, and simmer, covered, until tender, about 3 minutes. Drain well in a colander. With the zucchini and squash ready, the chicken should be finished cooking. Put the grilled tenders into a food processor (I used the 7-cup Cuisinart Food Processor (which I love)) and pulse them until finely chopped. 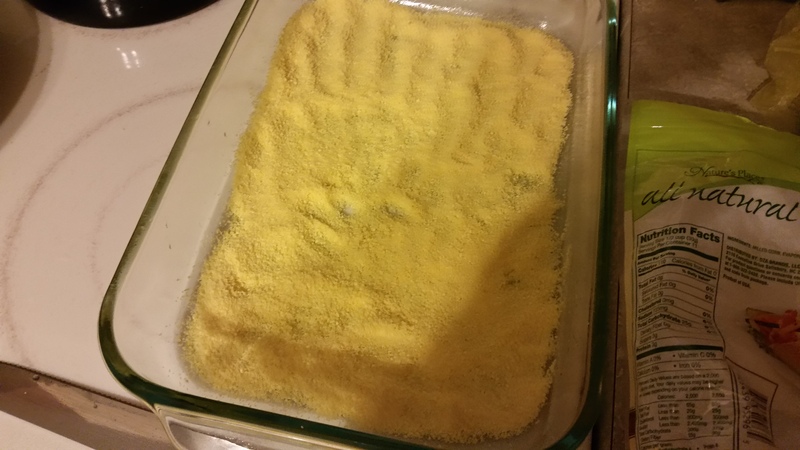 Press the bread crumbs on the bottom of the prepared Pyrex dish to form a crust and dot it with the remaining butter. Spoon zucchini and squash on top. Whisk eggs in a medium bowl until fluffy. 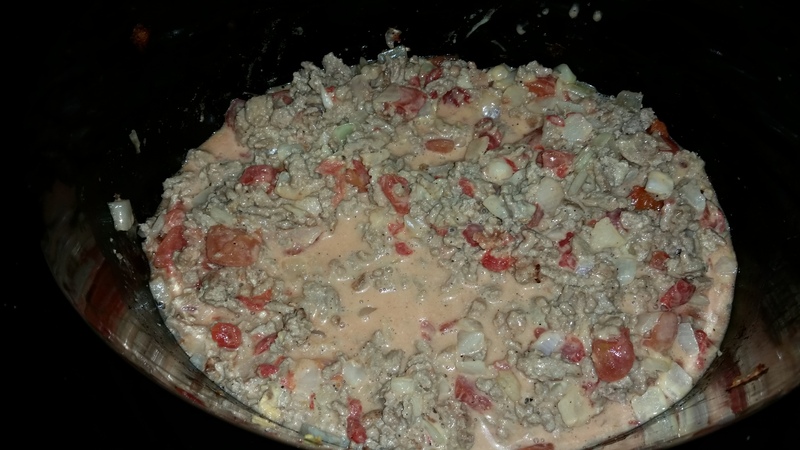 Stir in onion, milk, 2/3 cup Cheddar cheese, salt and pepper. Pour over zucchini and squash and sprinkle with remaining 1/3 cup Cheddar and Parmesan. I absolutely loved this dish and I hope you will too. It offered a new way to cook some old favorites. Let me know if you try it. I want to hear what you think! Let’s talk corned beef. First, let’s talk about how hard it is to find corned beef, not only the day before St. Patrick’s Day, but also the day before a rare St. Patrick’s Day snowstorm. After driving to various grocery stores, I finally found what I was looking for, but I really do suggest if you’re going to try this around leprechaun time shop early! With that out of the way, let’s get into the recipe. I love corned beef and cabbage. It’s something my mom routinely made when I was growing up, but this was my first attempt at actually cooking it myself. I’ll also note that although the recipe is called Mom’s Corned Beef, it’s not my mom’s recipe, but rather the author’s mother’s recipe. Sorry mom. The recipe I used is from “Four Generations One Roof” and I discovered it via Pinterest. Here it is. 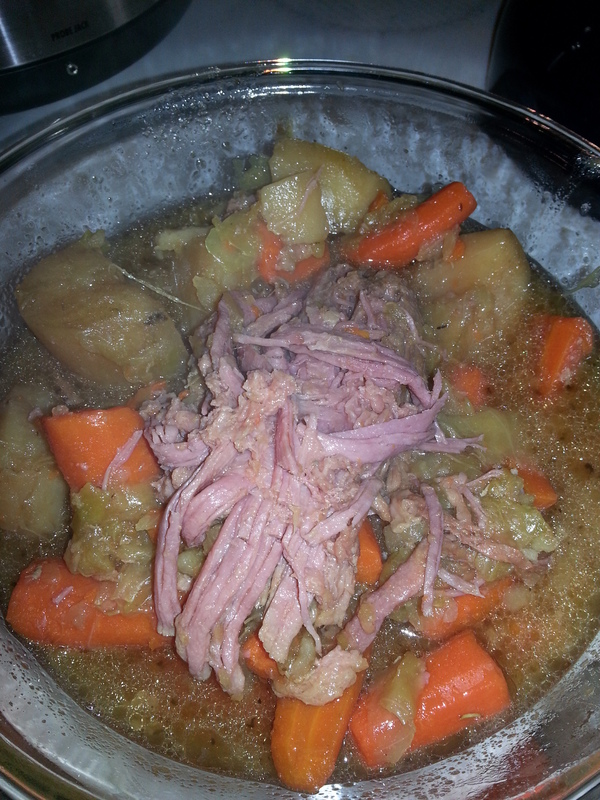 Being that there’s just two of us, (me and the hubs, no corned beef for Buddy), I used approximately a 1lb. corned beef and a small head of cabbage. 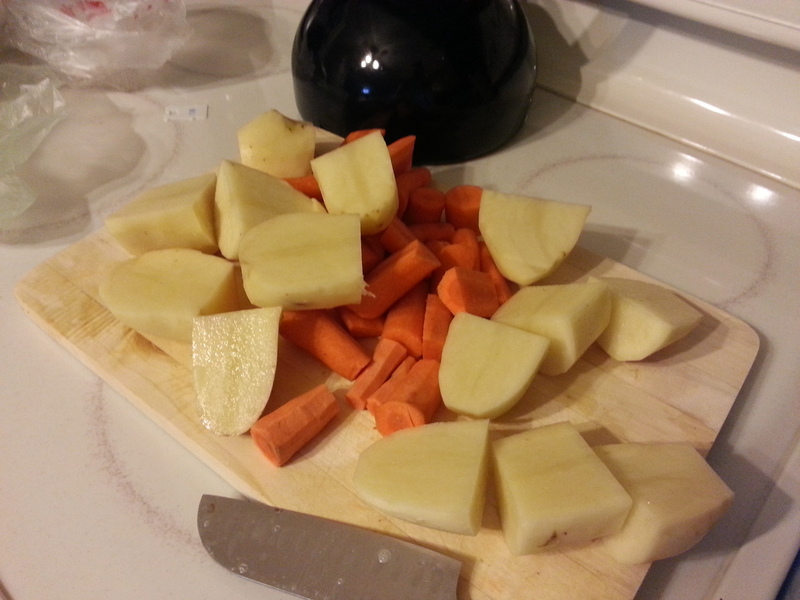 I also opted for a smaller bag of carrots, three potatoes and, being gluten free, made my beef broth using Better than Bouillon. 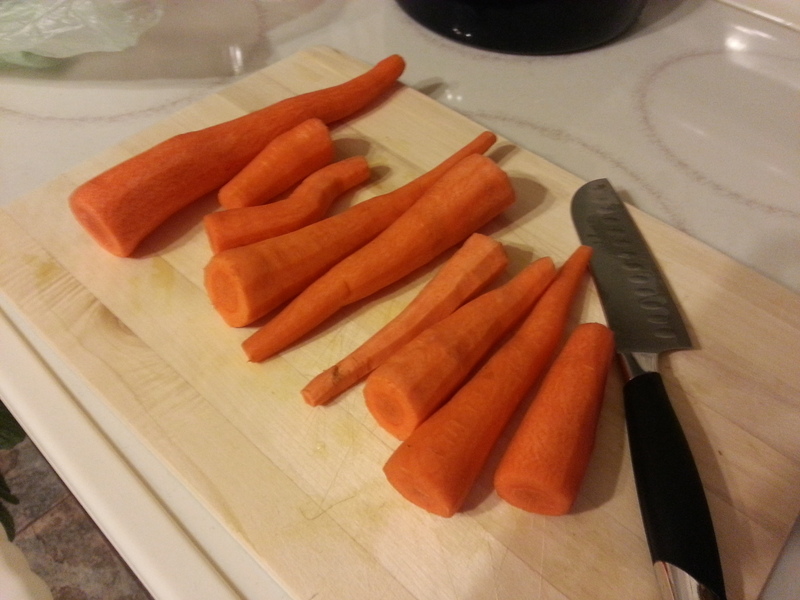 I followed the instructions, peeling my carrots and potatoes until I couldn’t peel no more. 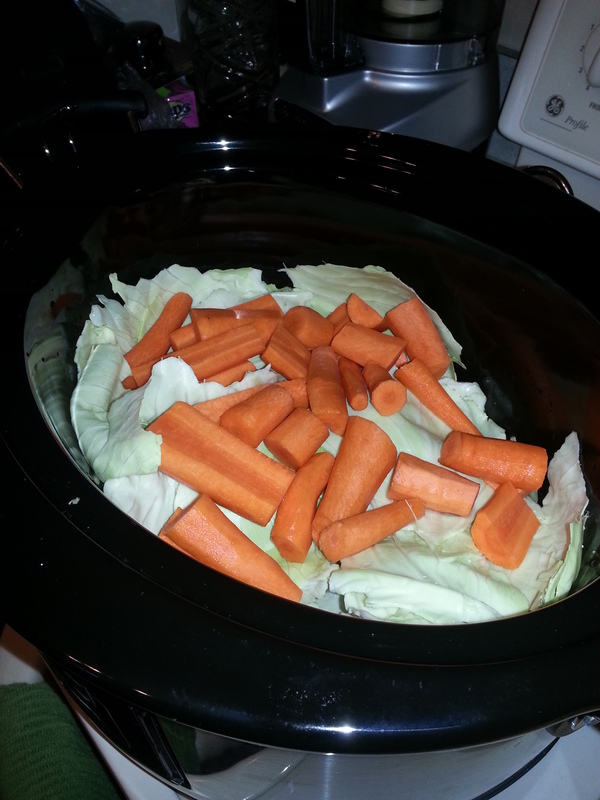 I put the carrots and cabbage in the crockpot, followed by the beef broth and then the corned beef on top. I then stuffed the potatoes down towards the vegetables and cooked that joker on high for 7 hours. During the last 30 minutes, I added some Italian seasoning. I know it was supposed to be added for the last hour, but I forgot. The dish came out great, although it wasn’t like mama fixed it. (Little Alan Jackson for you.) The cabbage wasn’t prominent enough, but the rest was fairly fabulous and kudos to me for getting in the Irish spirit. (Although I’m Scottish so my ancestors probably didn’t appreciate it.) Really, it could have been made to a smaller scale though because we had a ridiculous amount of leftovers. Live and learn. I have no affiliation with Four Generations One Roof and found their recipe via Pinterest. This post represents my experience with it. This is Buddy and we like to cook, a lot. Granted, his role is more moral support than anything since he just lays in the kitchen floor while I cook, but that counts, especially when I try to tackle something that’s on the complicated side and my husband isn’t here to catch my momentary meltdown. 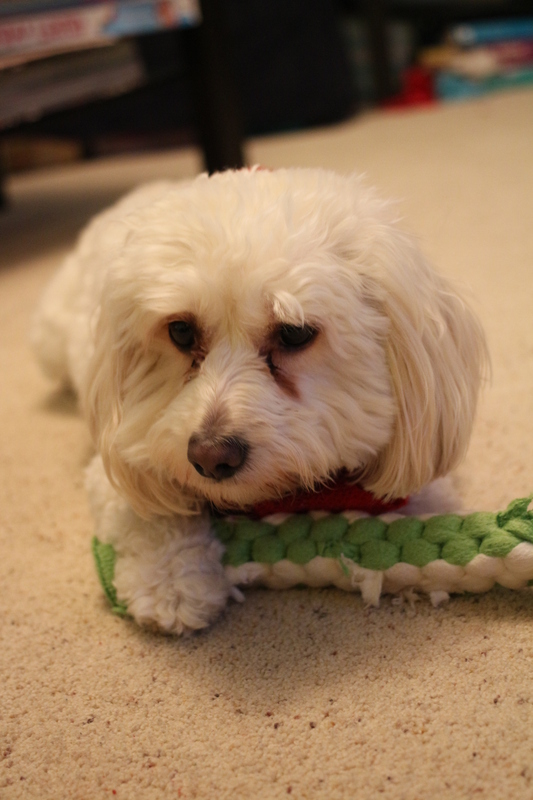 Earlier this week, Buddy and I tackled chicken fajitas in the slow cooker. We got the recipe off Pinterest via the website Stacy Makes Cents. It’s one I’ve actually made before and held on to it for future use. The recipe calls for a yellow onion, but I made turkey meatloaf the day before and had half a white onion left over, so I used that instead. 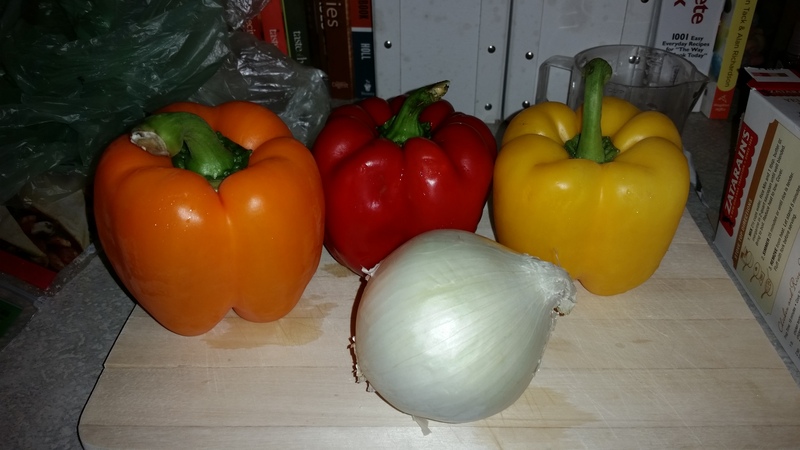 For peppers, I used green and yellow, which were left over from a three-pack I had also bought for the meatloaf. I also chose to use only 1/4 cup chicken broth (Wegman’s Organic Chicken Broth) since my chicken was still a little frozen in the middle and I didn’t want to end up with too much moisture. I put everything in the Crock-Pot, according to Stacy’s recipe, and cooked it on low for 8 hours. I had a late meeting for work, so the timing was perfect. And who doesn’t love a slow cooker? You can just fix it and forget it. Fabulous! I have a programmable Crock-Pot so when the cook time is up, it automatically switches to warm. Love it! When I got home, the chicken was a little scary looking. I’ll admit it. However, once shredded it looked amazing. I’m a gluten-free girl so I didn’t opt for the tortillas and I’ve yet to find a great corn tortilla, so I added shredded cheese and ate it paired with yellow rice, cooked by my husband while I was on my way home from work. It was pretty great. 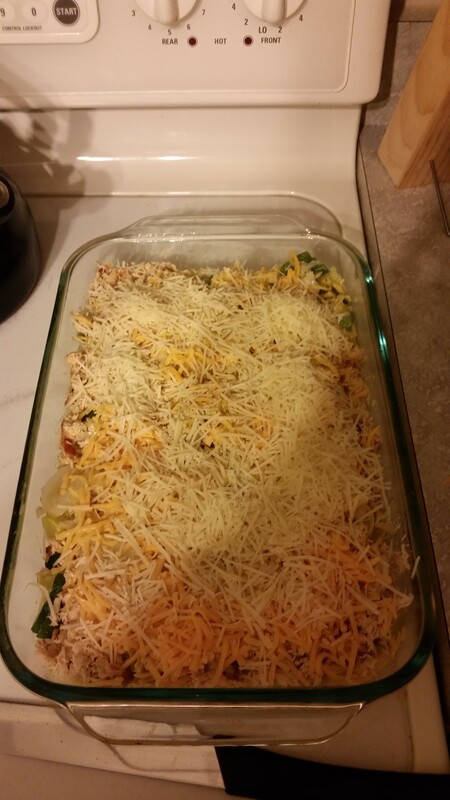 My only notes for next time would be to add lettuce and tomato along with shredded cheese post-cooking. I also think this would be great on chips, almost like chicken nachos. My husband said he’d up the spice factor, so maybe some additional peppers would help. I think it was definitely missing the red bell pepper, which I had included when I cooked it before. And Buddy? Well he only eats dog food (with the occasional treat), but I’m sure he enjoyed the smell. And check out Stacy Makes Cents for more great recipes. 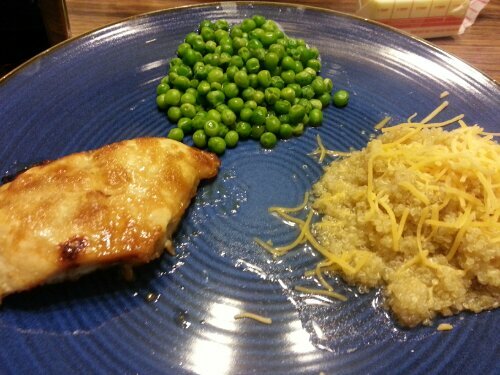 For dinner, I made brown sugar garlic chicken, peas and quinoa. I’ve been seeing quinoa everywhere and really wanted to try it. I got a bag today from my boss, who cooks it all the time with his wife. I used the basic recipe on the bag, which was pretty plain, and topped it with some cheese. It wasn’t bad, but it could have used some more flavor. Anyone have any good quinoa recipes to try? I had pasta today for the first time in over a month. I know this isn’t the best picture, but I realized I hadn’t put enough sauce on my plate after I had already added cheese. Anyway, I made gluten free pasta for the first time. It’s rice pasta, so it’s a little bit stickier than normal pasta. You have to constantly stir it while it’s boiling, but it was pretty good. 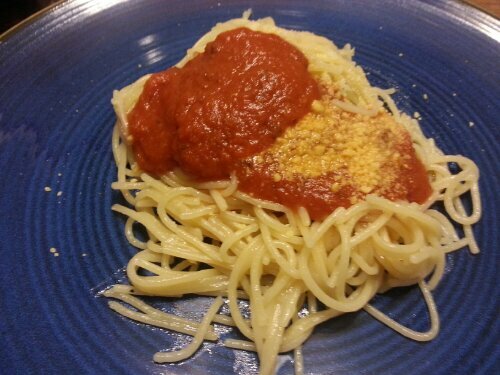 It was nice to have spaghetti again, since I hadn’t had it in quite a while. Ron made steak for dinner! It was so good. He used a bourbon brown sugar marinade. I was sad we only bought two steaks because I definitely could have ate another one. 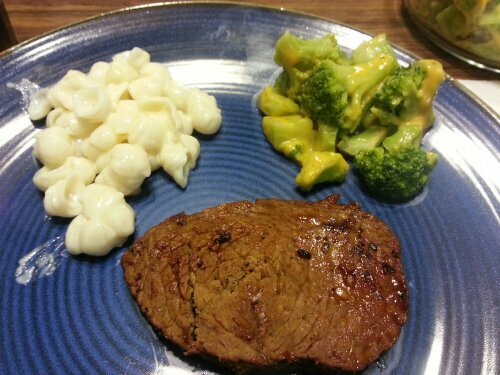 He paired it with Annie’s gluten free shells and cheese and broccoli and cheese. Yum! Ron made dinner tonight for Valentine’s Day and it was amazing! From our cruises, I’ve developed a love for lobster. His definitely didn’t disappoint. He was so excited about it too because he’s never made it before. And the tilapia was awesome too. 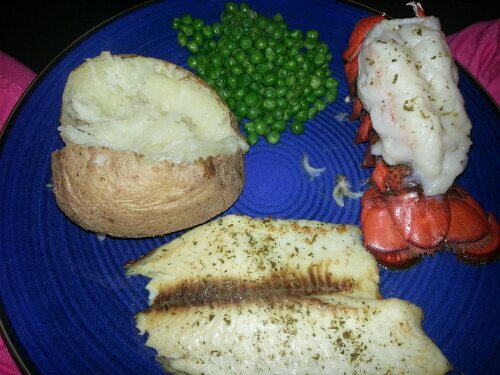 It was definitely a great Valentine’s Day meal. Yum!